Kayaks were invented by the Inuit, the indigenous people of the Arctic regions. Made from sea mammal skins stretched over wood, whalebone, and other sturdy frames, the ancient vessels were used for hunting and traveling. Since then, kayaks have been covered by fabric, made from fiberglass, can be folded or inflated, and are used for sport and recreation. Traditional kayak styles are meant to keep the paddler warm and dry, but the open design of sit-on-top (SOT) kayaks are ideal in our warm climate. For beginner or strictly recreational kayakers, SOTs are very stable, comfortable, and easy to navigate. Tandem kayaks (more than one seat) make for easier steering, communication, and ability to work as a team or take a short rest. The person sitting in the rear of the kayak is responsible for steering, so if you're going out with a more experienced paddler, have them steer while you get used to the rhythmic strokes. With about 160 members from beginners to seasoned veterans and twentysomethings to octogenarians, Hui Wa'a Kaukahi (Hawaiian for a group of single canoe paddlers) is the state's largest and oldest recreational kayak club. Formed in 1982, Rusty Lillico is one of the club's original members and its current vice president. 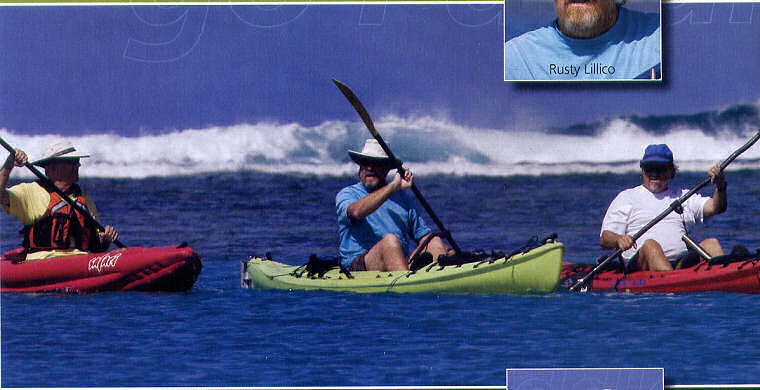 "When I first came to Hawai'i, I took a continuing education class in kayaking as kind of a lark. By the time I finished my first solo paddle, I was an addict and I haven't stopped since," he says. "It gets me out of the house, it occasionally puts fresh fish on my table, and it always makes me realize how lucky I am to live in Hawai'i!" Lillico says Hui Wa'a Kaukahi has a saying: If your muscles hurt at the end of a paddle, you're doing something wrong. "We're not a competition-oriented club, so we tend to avoid paddles that require washboard bellies and channel-crossing stamina." Generally, kayaking is a light aerobic activity that relies mostly on strength and endurance. Depending on your experience and goals, kayaking is the type of activity that can be as intense as it is relaxing. Hui Wa'a Kaukahi events range from the relatively short, flat water "easy gliders" to open ocean, advanced paddles and expeditions that last two days or more. Lillico says his club also has some members who are very active in kayak surfing, but it's a more strenuous form of the sport that's not for beginners. "Not everyone is suited to kayaking," Lillico says, "but you'll never know until you try. The people who do make the connection always wonder why it took so long to find it." Hui Wa'a Kaukahi has about three clinics every year, covering everything from kayaking basics to advanced surfing techniques. The clinics are open to the public and led by club members who are experienced and certified ocean instructors. For Lillico, kayaking has brought more than physical fitness. He says, "Most of the people I consider my best friends I have met through kayaking." That includes his wife and his business partner. Lillico says that paddling well requires some degree of self-reliance and risk taking. "But the rewards are self-esteem, confidence, a different point of view about the ocean and Hawai'i, and the friendship of a perhaps eccentric but dedicated group of enthusiasts." Visit www.huiwaa.org for information on Hui Wa'a Kaukahi membership and activities.